Located in Southwestern Illinois, 39 minutes south of St. Louis, 14 minutes from Waterloo and just 3 miles from the Mississippi River! Call or text me (David) at 618-580-5875 right now....to book a room or order a gift certificate. Join us for theater, bed and breakfast the first two weekends in April! See Mark Twain's play, Is He Dead?, at the historic Capitol Theater in Waterloo, just 15 minutes from Maeystown. Performances are Friday and Saturday, April 5 & 6 (7:30 start time) and Sunday, April 7, at 2:30...The show will also be performed at week later on April 12, 13 and 14 at the same times. Stay two nights, Friday and Saturday, now through April 27, and receive the 2nd night at 40% off!!! 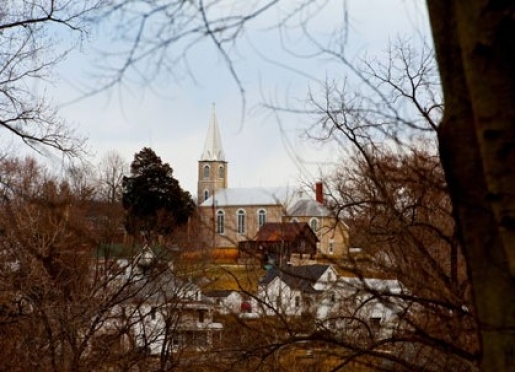 Stay with us this weekend or anytime this spring and enjoy the scenic beauty of our our quaint village!! Visit the shops and eat at Vici's Front Porch on Saturdays. ....Take a walk along the Maeystown Creek. The village shops and stores are open only on Saturday and Sunday! Stay with us two days on a Friday and Saturday....Journey to Fults Hill Nature Preserve, Fort de Chartres, Fort Kaskaskia, the confluence of the Mississippi and the Kaskaskia River....all within 40 minutes!! Or take in a Cardinals game in St. Louis this summer...also just 40 minutes away! 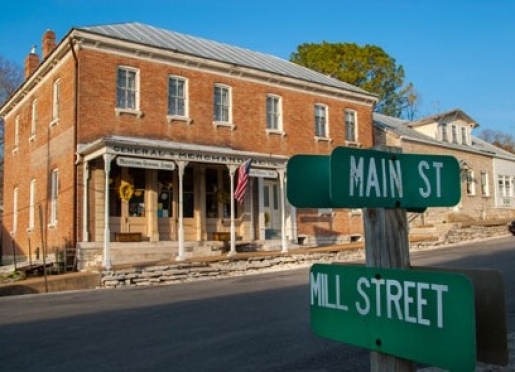 Stay with is any weekend and visit the Maeystown General Store, Georgia Mae's Antiques, the Corner George Inn Sweet Shoppe (closed during the winter), the Kaffeehaus, and Vici's Front Porch and Tea Room (open Saturdays only) ...All shops open on Saturday and Sunday!!! Fine restaurants are located nearby in Waterloo and Foster Pond. Welcome to the Corner George Inn Bed & Breakfast in Maeystown, Illinois. Imagine crossing a one-lane stone arched bridge into the quaint German village of Maeystown, Illinois and staying at the Corner George Inn Bed & Breakfast, a restored 1884 hotel and saloon. Located just 39 minutes south of St. Louis in the Mississippi River bluffs, the inn offers six charming antique appointed guest rooms in. In Maeystown you can relax in a quiet village setting, take a walking tour of the town, ride in a horse-drawn carriage, dine in a friendly atmosphere, browse through unique shops, arrange a picnic lunch and enjoy the scenic countryside; including whirlpool and loft suites, country and Victorian rooms, and a summer kitchen guest cottage. Join us for a two night Friday and Saturday night weekend! All of the shops are open on Saturdays and Sundays from 11 - 4. Join me for lunch at "Vici's Front Porch" on Saturdays from 11:30-2:30 p.m. Check Facebook for this week's menu! Join us for a Weekend Getaway this week! Shops and museum are open weekends from 11-4 pm. Vici's Front Porch open for lunch only on Saturdays, 11:30-2:30. Our Bed & Breakfast is open year round. Today the Inn consists of four buildings: the original inn, the summer kitchen and two rock houses. There are a total of six guest rooms, each with a private bath. In the original inn there are sitting rooms on both floors, a wine cellar, a "ping pong mezanine" and a 600-square-foot ballroom. The ballroom serves as a commons area for guests and as a dining area for breakfast. It also lends itself to larger group activities. The entire building is furnished with antiques and is fully air-conditioned. Out-buildings are still present on the grounds. David, Marcia, and their staff invite you to join them for breakfast in the ballroom and then for a walk through the quiet and serene village as you take a step back in time. Horse-drawn carriage rides in the country are available upon request. Please inquire about arrangements when making reservations. From I-255, you can find us by taking Illinois 3 (exit 6) to Columbia and continuing to Waterloo. Then, turn right at Illinois 156, go three-quarters of the way around the traffic circle onto Lakeview Drive and then 8 miles to Maeystown. Marcia and David are enjoying their 30th year as innkeepers! They also have a dog named Peanut, their dachshund, who continues to guard the house next door and sit in the window on sunny spring days! The 167 year old German settlement of Maeystown is just one of a handful of villages in the state of Illinois listed on the National Register of Historic Places in its entirety. Some 60 stone, wood and brick structures remain from the 1800's. Today the bed and breakfast, general store, sweet shop, museum and visitors' center, numerous residences and the 1867 church have been restored. 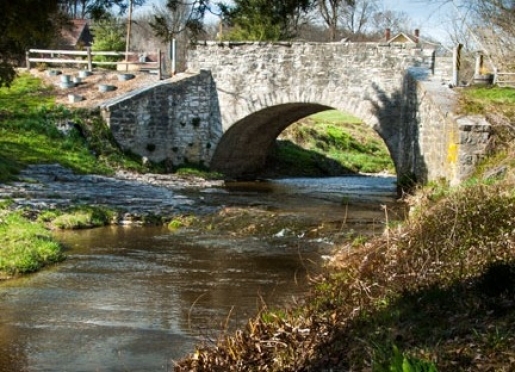 The one lane stone arched bridge leading into town stands as the centerpiece of the village. Taste local wines at the Schorr Lake Vineyard and Winery in Waterloo and the Red Bud Winery. Golf at two fine golf courses, Acorns and Annbriar, both within 15 minutes of the inn. Drive or cycle along the scenic bluff road which leads to the Fults Hill Prairie Nature Preserve and two state historic sites, Fort de Chartres and Fort Kaskaskia. Visit the confluence of the Kaskaskia and Mississippi rivers. Cross the mighty Mississippi on the ferry to historic Ste. Genevieve. And for members of the Amateur Trapshooting Association (ATA) drive just 40 minutes to Sparta to the World Shooting and Recreational Complex. Vici's Front Porch is open for lunch on Saturdays from 11:30 am to 2:30 pm and for groups of 10-20 (lunch/dinner) by appointment. Vici is also open during festivals. Call Vici at 618-539-3665 to make reservations. Hungry for homemade sweets and ice cream? Stop by the Corner George Inn Sweet Shoppe on Saturday's and Sundays from 11 am to 4 pm. Closed during winter months. Looking for an antique or gift item? Just ask Anita at the Maeystown General Store on Saturdays and Sundays from 11 am to 4 pm. Find even more antiques across the street at Georgia Mae's Antiques, open on Saturdays and Sundays from 11 am to 4 pm. Marcia will be glad to help you. At the back of Georgia Mae's Antiques is our coffee shop, Arnie Juelf's Lil' Red Roaster Kaffeehaus. Stop by any Saturday and Sunday 7:30 am to 1 pm and enjoy the best coffee and pastries around!!! If you are looking for food stop at one of four fine restaurants before or after your visit... Dreamland Palace German Restaurant in Foster Pond; Frederico's, Gallagher's or JFires Market Bistro in Waterloo. Finally, the Maeystown Preservation Society Mill & Museum offers a glimpse of village history from 11 am to 4 pm on Saturdays and Sundays and no visit to our historic village is complete without a walk along the beautiful Maeystown Creek. See where the two creeks come together and walk up to the 1881 stone bridge. 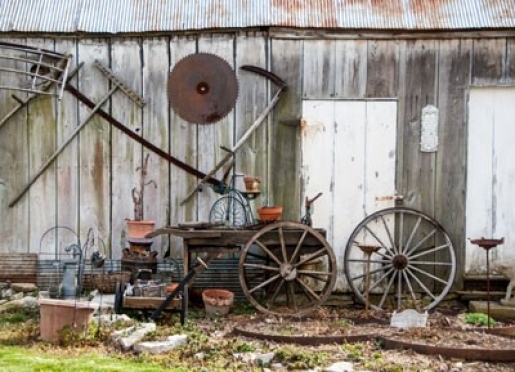 May 5, 2019 (Sun) 9-4 Maeystown annual Frühlingsfest/Springfest...antique and garden show along the Maeystown Creek...lots of good food! January 4, 2020 (Sat) Attend the Twelfth Night Ball in Prairie du Rocher and stay the night with us. February 14, 15 & 16, 2020 (Fri, Sat & Sun) Join us for Valentine's Weekend, Friday, Saturday and Sunday...Two night minimum stay! Click on the link below to see all of our most recent reviews!! Corner George Inn and Maeystown Featured on TV! See the Corner George Inn and Maeystown featured on WGN-TV Chicago.